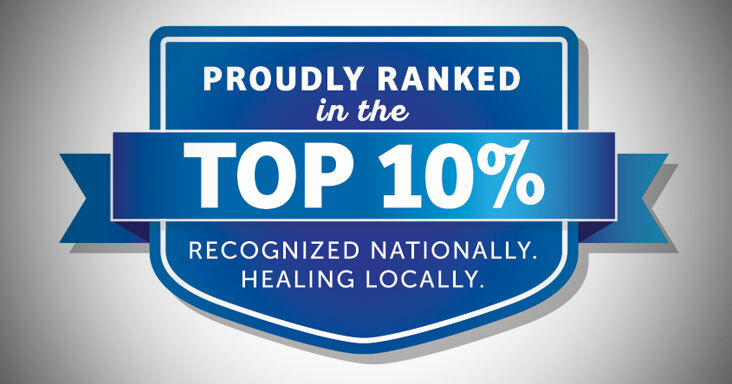 Mountain Valley Regional Rehabilitation Hospital has been named in the Top 10 percent of inpatient rehabilitation facilities in the United States for the 11th year in a row. The hospital’s care was cited as being as being patient-centered, effective, efficient and timely. Mountain Valley Regional Rehabilitation Hospital was ranked in the Top 10 percent from among 870 inpatient rehabilitation facilities nationwide by the Uniform Data System for Medical Rehabilitation (UDSMR), a non-profit corporation that was developed with support from the U.S. Department of Education, National Institute on Disability and Rehabilitation Research. The UDSMR maintains the world’s largest database of rehabilitation outcomes. “If you take into account that a national study has previously shown that inpatient rehabilitation facilities provide better long-term results for patients, being ranked at the top of that group validates the quality of care we provide,” says Dr. Alan Berman, Medical Director of Mountain Valley Regional Rehabilitation Hospital, referencing a study commissioned by the ARA Research Institute that showed patients treated in inpatient facilities experienced improved quality of life as compared to skilled nursing facilities. Through the UDSMR, Mountain Valley Regional Rehabilitation Hospital also will collaborate with peers throughout the nation to share information and establish best practices for patients. “This helps elevate rehabilitative care for everyone across the United States,” Berman says. Mountain Valley Regional Rehabilitation Hospital provides specialized rehabilitative services to patients who are recovering from or living with disabilities caused by injuries, illnesses, or chronic medical conditions. This includes, but is not limited to, strokes, brain injuries, spinal cord injuries, orthopedic injuries, cerebral palsy, ALS (Lou Gehrig’s Disease), multiple sclerosis, and Parkinson’s disease.